Terrain representation is the manner by which elevation data are visualized. Data are typically stored as 2.5D grid representations, including digital elevation models (DEMs) in raster format and triangulated irregular networks (TINs). These models facilitate terrain representations such as contours, shaded relief, spot heights, and hypsometric tints, as well as automate calculations of surface derivatives such as slope, aspect, and curvature. 3D effects have viewing directions perpendicular (plan), parallel (profile), or panoramic (oblique view) to the elevation’s vertical datum plane. Recent research has focused on automating, stylizing, and enhancing terrain representations. From the user’s perspective, representations of elevation are measurable or provide a 3D visual effect, with much overlap between the two. The ones a user can measure or derive include contours, hypsometric tinting, slope, aspect, and curvature. Other representations focus on 3D effect and may include aesthetic considerations, such as hachures, relief shading, physiographic maps, block diagrams, rock drawings, and scree patterns. Relief shading creates the 3D effect using the surface normal and illumination vectors with the Lambertian assumption. Non-plan profile or panoramic views are often enhanced by vertical exaggeration. Cartographers combine techniques to mimic or create mapping styles, such as the Swiss-style. This entry was published on November 24, 2017. This Topic is also available in the following editions: DiBiase, D., DeMers, M., Johnson, A., Kemp, K., Luck, A. T., Plewe, B., and Wentz, E. (2006). Representing terrain. The Geographic Information Science & Technology Body of Knowledge. Washington, DC: Association of American Geographers. (2nd Quarter 2016, first digital). 2.5D grid representation: A regular or irregular x,y grid in which each grid cell or vertex has one and only one z-value. 3D effect: A representation in which the viewer is given a visual impression of variations in the x,y,z values. aspect: The compass direction in which the terrain’s z-value changes most rapidly in the downslope direction. block diagram: An oblique view of terrain that also includes cutaway views of the subsurface, often along the edges of the map’s extent. contour: A line connecting points of equal elevation. curvature: The second derivative of an elevation surface. 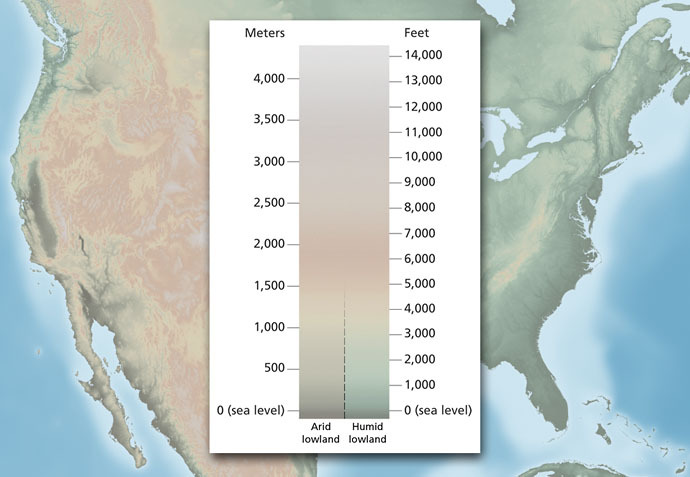 elevation: The height or depth of a terrain element with respect to a vertical datum plane such as sea level. hachure: Short lines drawn in the direction of steepest slope and often varying in weight to create relief shading. hypsometric tinting: The application of colors to terrain based on elevation values above or below a vertical datum plane such as sea level. illumination vector: A theoretical direction from which terrain is lighted for 3D effect. It is used to calculate relief shading. Lambertian assumptions: Terrain is a diffuse reflector and the brightness of surface elements is the dot product of the illumination and the surface normal vector. panoramic view: A viewing direction of a terrain representation that is neither perpendicular nor parallel to the x,y vertical datum plane. physical model: A scaled-down real-world 3D display of terrain. physiographic map: A plan or oblique view that represents a map extent while sketching landforms and often includes relief shading. plan view: A map viewed perpendicular to the x,y vertical datum plane. Maps in plan view often rely on relief shading to create a 3D effect. profile view: A terrain representation viewed parallel to the x,y vertical datum plane. Profile views typically represent one trace across the x,y plane. relief shading: Variations in shades of grey, or dark and light contrasts, that provide a 3D effect by assigning gray-scale values predicted with the Lambertian assumptions. rock drawing: The depiction of rock outcrops or bedrock exposures, typically on a large-scale map of mountainous terrain. scree patterns: The depiction of loose rocks covering a slope, typically on a large-scale map of mountainous terrain. slope: A measure of the deviation from horizontal of a terrain element. surface normal vector: A vector perpendicular to each surface element of the terrain used to calculate relief shading. Swiss-style: A style that combines various methods of terrain representation such as relief shading, contouring, rock drawing, and scree patterns in a manner consistent with the long-established practices of Swiss cartographers that creates a three-dimensional relief impression. vertical exaggeration: Scale factor applied to elevation values. Representing terrain on maps has historically been a cartographic objective of special attention (Harvey 1980), and continues to offer interesting challenges and creative opportunities to modern-day cartographers. Terrain representations begin with elevation values measured from some vertical datum plane such as sea level. While limited numbers of spot heights and soundings were historically recorded directly on topographic and bathymetric maps respectively (Imhof, 1982), voluminous modern elevation data require effective data models. Elevation data are typically stored in 2.5D grid representations (Weibel & Heller, 1991), in which each grid element or its vertex has a unique elevation value. 2.5D grids generally provide an adequate representation of the terrain, as the land’s surface is continuous and smoothly varying, and data collection platforms operate well above the terrain surface. The representation can be a raster grid composed of typically square grid cells with one elevation value per cell, or a triangulated irregular network (TIN) in which the three vertices of each triangle have a unique elevation value. Both are referred to as digital elevation models (DEMs). Viewing direction is an important concern of all terrain representations. Views are typically from some direction above the terrain and thus could be imagined as originating from any point on a large hemisphere surrounding a much smaller, centrally placed terrain model. Looking down on the terrain from the hemisphere’s apex results in a plan view (Robinson et al., 1995, Slocum et al. 2009), while looking across from any point on the lower edge of the hemisphere provides a profile view (Imhof, 1982). These views are oriented perpendicular and parallel to the elevation values’ vertical datum plane respectively, which approximates a horizontal plane for large-scale maps. Views from all remaining directions are panoramic or oblique views. Profiles typically are drawn as a line of varying z-value to show changes in elevation in the view along an x,y trace on a map. Such profiles typically do not attempt to represent foreground or background details. Profiles commonly use vertical exaggeration to stretch displays in the z-direction to highlight visually subtle variations in relief, or changes in elevation. Profile views that also show details of the subsurface are referred to as geologic cross sections. Panoramic views display the terrain surface from an oblique perspective. These views show changes in the surface’s x, y, and z values across the view’s extent, providing an intuitive representation of the terrain, but also resulting in hidden areas as landforms in the foreground block views of the background. Panoramic views also use various shading techniques discussed below to enhance the 3D effect, and often use vertical exaggeration to highlight relief. Figure 1. A panoramic view of Mt. 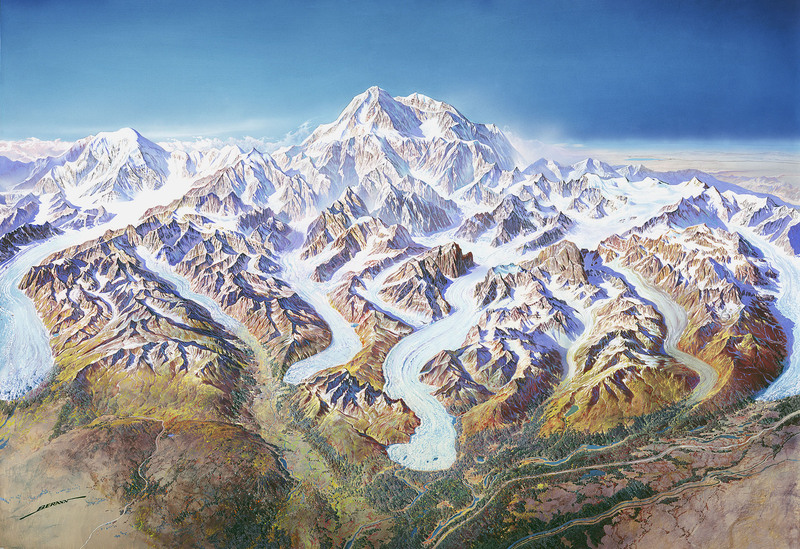 McKinley (Denali) hand-painted by Heinrich Berann for the US National Parks Service. Patterson (2000) discusses his analysis and automation of Berann’s methods. The panoramic maps of Heinrich Berann are striking examples of such views (Figure 1). Patterson (2000) documents how Berann’s perspective views used a curved surface to foreshorten the distance to mountaintops and vertically exaggerate the terrain. The physiographic maps of Raisz (1931) (Figure 2) and Harrison (1941) are two examples of plan or panoramic base maps that sketch panoramic views of landforms for 3D effect. Visvalingam and Dowson (1998) automated panoramic mapping to create similar, sketched effects. Jenny and Patterson (2007) developed the plan oblique relief method, which shows landforms from their side view on a plan basemap. Panoramic views that also show cutaway views of the subsurface along the map’s edges are referred to as geologic block diagrams, and Lobeck (1924) offers quantitative techniques for their construction. Figure 2. 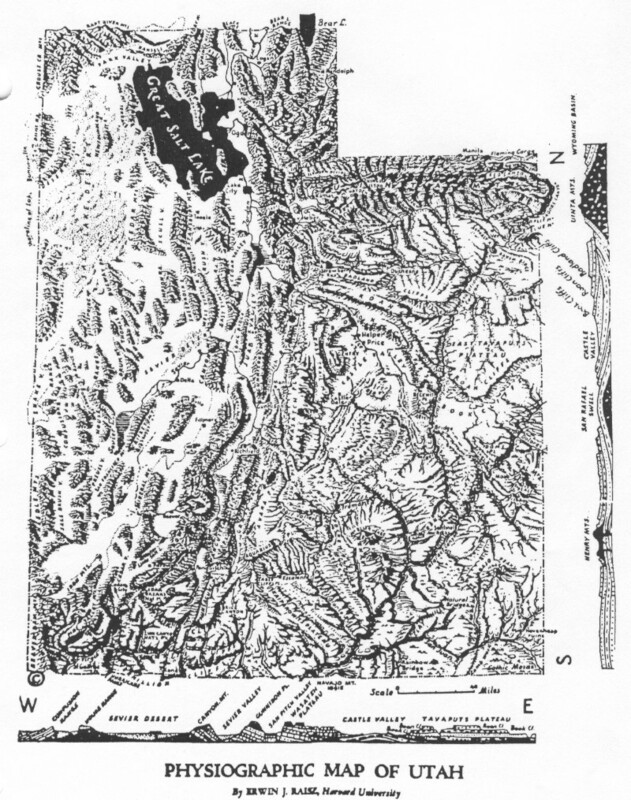 A physiographic map of Utah hand-drawn by Erwin Raisz. Although the basemap is a plan view, the sketches of landforms show variations in the x, y, and z directions as well as relief shading. Raisz also included two geologic cross sections. Reprinted with permission from John Wiley and Sons, Inc.
Plan views offer special challenges in terrain representation (Slocum, 2009), as the entire view is designed to show changes in the x,y directions, with no intrinsic technique to show the 3D effect. As a result, a number of methods have been devised to represent terrain in plan view. These techniques can be broadly categorized into two categories: 1) those interested in a measurable representation of elevation values, and 2) those interested in creating a 3D effect. The following sections will explore techniques in these categories. Elevation values can be measured from plan views, making terrain representations useful for map reading, interpretation, and analysis (see Map Reading, Map Interpretation, Map Analysis). Early representations include contours, isarithmic lines – a common thematic map type – that connect points of equal elevation (Imhof, 1982, Robinson et al., 1995; see Common Thematic Map Types). Measuring or approximating differences between contours allows for an assessment of the steepness of the terrain. The use of an appropriate contour interval (e.g., 20 feet) and index contours (e.g., every 5th contour of 100 feet drawn with a thicker line) are important design considerations. These criteria will change with map scale and the steepness of the terrain, resulting in the need for generalizing contours. Hypsometric tints assign classified or unclassified color schemes to elevation across the map’s extent (Imhof, 1982). These colors can represent variations seen with elevation change in a particular area (Imhof, 1982, Jenny & Hurni, 2006, Leonowicz et al., 2009). Imhof (1982) includes a number of hypsometric color schemes for elevation and bathymetry in Plate 5. Patterson and Jenny (2011) account for global changes in the colors of natural environments of world regions with their cross-blended hypsometric color schemes (Figure 3). Hypsometric color schemes can also be designed with hue and saturation, with relief shading modulating the lightness of the colors (White, 1985). Figure 3. A cross-blended hypsometric tint map of the conterminous United States with a different color scheme for arid and humid lowlands (from http://www.shadedrelief.com/physical/pages/about.html). Reprinted with permission from Tom Patterson. These techniques allow users to approximate elevation values or make direct measurements, and in some cases to calculate derivative functions. For example, given two elevation values with consistent changes in elevation between them, the user calculates slope from the distance and difference in elevation. Similarly, the aspect vectors can be constructed normal to contour lines, pointing downslope. These calculations can also be made on gridded data across the terrain (Chang, 2013), resulting in classified or unclassified slope and aspect maps. One consideration of all of these representations is that they do not offer a strong 3D effect to most map users. For example, closed contours representing a hill will show the plan shape of the hill (e.g., circular versus oval), and the spacing of the contours will provide a shading effect (e.g., black contours on a white background approximate shades of gray). This shading, however, is one described by Imhof (1982) as “the steeper the darker,” and is generally considered to result in a poor 3D effect. As a result, terrain representation has focused on a number of methods that combine the 3D effect with interesting, artistic designs. A focus of terrain representation research is the creation of a 3D effect with shading and sometimes a casting of shadows. The approach necessitates illuminating the terrain from a theoretical light source originating form the surface of a hemisphere surrounding the terrain, such as the viewing hemisphere discussed in Section 3. A single illumination vector would originate at the hemisphere and cast parallel rays across the terrain. An illumination vector from directly overhead creates a vertical shading effect, and vectors from the base of the hemisphere would cast shadows over much of the terrain model. Illumination vectors from the northwest and at an intermediate inclination between horizontal and vertical seem to provide a preferable 3D effect (Imhof, 1982). The dot product of the illumination and a surface normal vector to each surface element assumes a diffuse Lambertian reflector and is calculated as the cosine of the angle between the two vectors in 3D space (Wiechel, 1878). The result in a map showing shades of gray that are proportional to the amount of light received on each terrain element given its orientation to the direction of illumination. This relief shading technique is similar to the artistic effect of chiaroscuro and creates a strong 3D effect (Horn, 1982). Like slope or aspect, relief or hill shading values can be read directly from a shaded relief map, but only provide the shade of gray predicted by the Lambertian assumption. Imhof (1982) includes interesting examples from the historical development of relief shading in the first chapter of his book, and dedicates his ninth chapter to shading and shadows cast under oblique lighting. The latter represents the culmination of hand-shading in the Swiss-style (Figure 4), including adding color highlights to illuminated and non-illuminated terrain. Seasoned cartographers began with a contour framework, and applied shading, taking into consideration the orientation of terrain elements with respect to a theoretical illumination source. They often varied the direction of illumination across the map’s extent to enhance terrain structure and highlight important terrain features. Horn (1982) published a review article that paid homage to hand-drawn relief shading but also reviewed seminal work in automating such techniques, including research conducted by Yoeli (1959, 1965, 1966, 1967), Brassel (1974), Brassel et al. (1974), and Peucker et al. (1974). Figure 4. 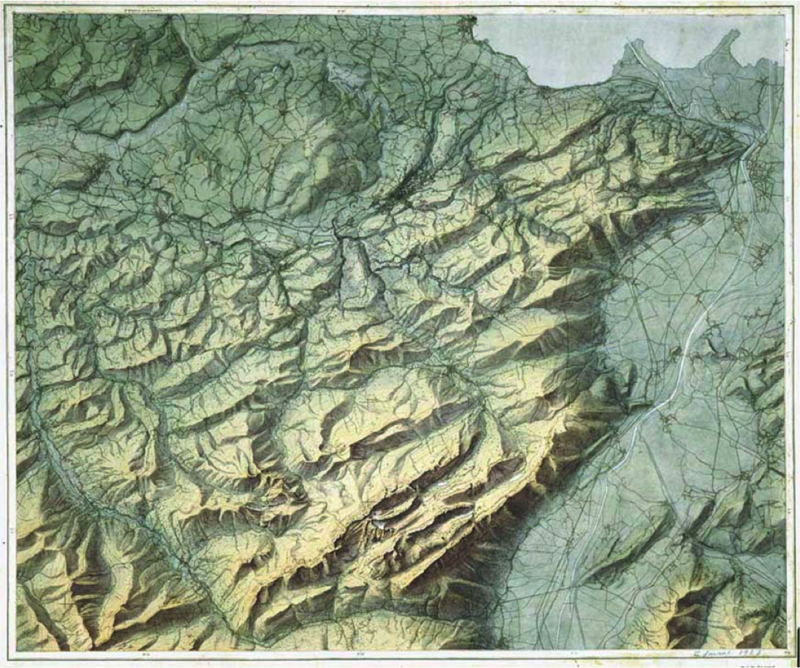 A relief shaded map of the Swiss Appenzell area with hypsometric tinting and color highlights on illuminated and non-illuminated terrain, hand-rendered by Imhof (1923). Reprinted with permission from Swisstopo and the Imhof family. Two watershed events in automating relief shading occurred in the United States near the end of the 1980’s. The first was an iconic shaded relief map of the conterminous US created by Pike and Thelin (1989). The second occurred in 1990 when Esri added a major subsystem (GRID) for raster processing to ARC/INFO 6.X that included its “hillshading” command. Adding relief shading to maps became part of many cartographic workflows, and researchers explored options for adapting the default technique and its assumptions to create enhanced or stylized relief shadings. 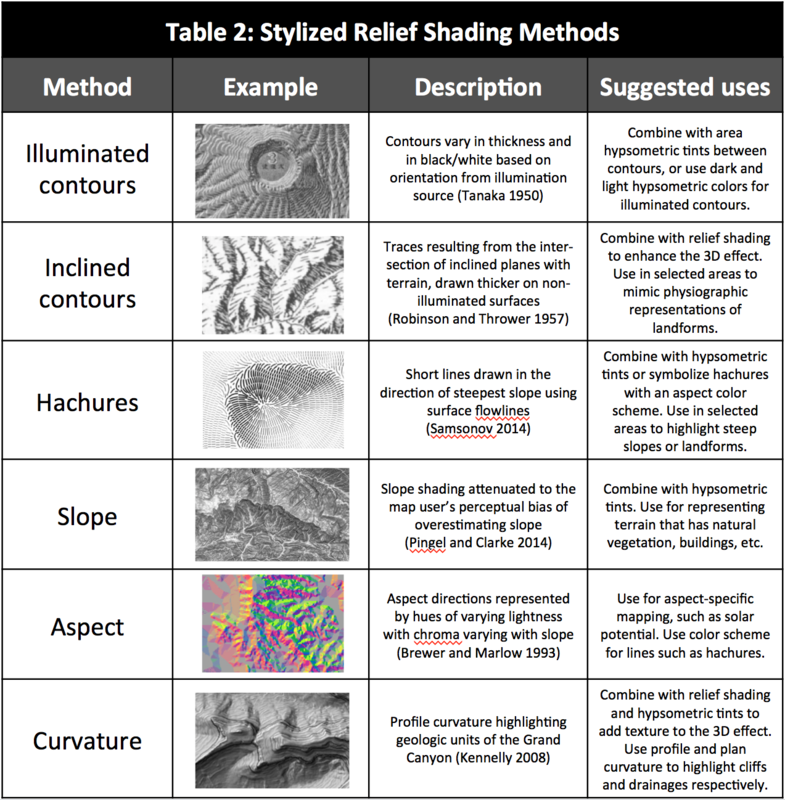 A portion of Pike and Thelin’s map and examples of enhanced relief shading methods are included in Table 1. Table 1. Examples of relief shading methods. The classic method used by Pike and Thelin (1989) has been enhanced by adding additional illumination sources from various directions, varying the intensity of the illumination, and locally altering the direction of illumination. Images reprinted and/or modified with permission from the following authors: Tom Patterson, Fabio Veronesi, Lorenz Hurni, Patrick Kennelly and James Stewart. One line of research focused on locally varying the orientation of the illumination vector to highlight specific landforms. Imhof (1982) makes a strong case for the importance of such adjustments, and Brassel (1974) proposes such automated changes in selected areas. Jenny (2001) first devised an interactive approach to locally adapt the lighting direction that especially benefited landforms parallel to the primary illumination direction. More recent research by Varonesi and Hurni (2015) used two illumination directions and corrects tone by elevation and slope, while an innovative method by Martsen and Jenny (2015) adjusts illumination directions using ridgelines and valley lines derived from a DEM. An alternative line of research proposed combining multiple shaded relief layers for an enhanced relief effect. Imhof (1982) suggested combining oblique shading with vertical, and Patterson and Hermann 2004 define an automated method. Other researchers have used multiple illumination vectors, such as the red-green-blue light sources of Hobbs (1999), while Mark (1992) and Patterson (1997) illuminate terrain from different directions, selecting and processing the results. Numerous illumination vectors can approximate the light distribution of a surrounding hemisphere. Yokohama et al. (2002) use a measure of openness to show how much brightness from a uniformly lit sky would reach each terrain element. Kennelly and Stewart (2006, 2014) adapt existing sky models that define the distribution of luminance in the sky to shade and cast shadows on terrain (Figure 5). Figure 5. 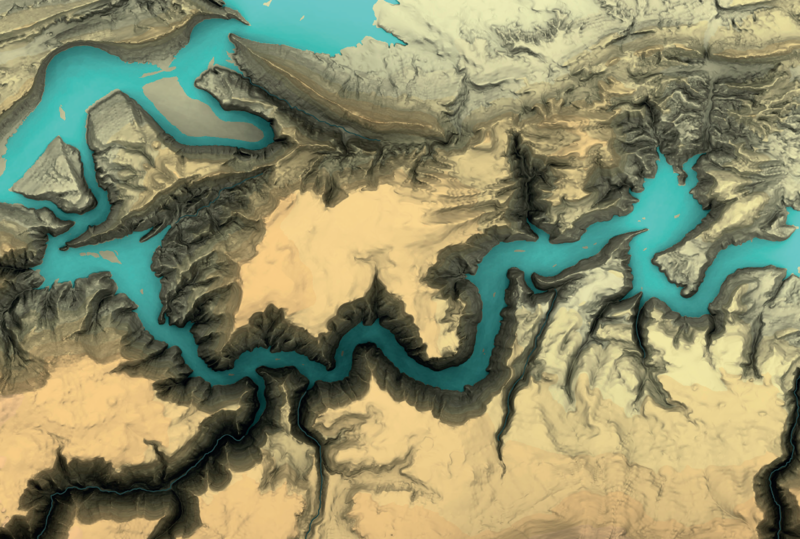 A map of the Flaming Gorge reservoir using hypsometric tints and shaded with an overcast sky model using the techniques described in Kennelly and Stewart (2014). Reprinted from Kennelly and Stewart (2015) with permission. Certain stylized relief shading techniques focus on creating or enhancing the 3D effect (Table 2). Contours typically give a vertical illumination effect, but Tanaka (1950) derived a method for creating oblique lighting with illuminated contours. Beginning with a medium gray background, contours on the illuminated sides of terrain are drawn in white and those on the non-illuminated sides are drawn in black, with thickness varying by the dot product of the illumination and aspect vectors. Researchers later automated his method, including Peucker et al. (1974), Etyon (1984), Kennelly and Kimerling (2001), and Eynard and Jenny (2016). Table 2. Examples of stylized relief shading methods that create or enhance the 3D effect, with a brief description and suggestions for their uses. Images reprinted with permission of John Wiley and Sons, Inc., the British Cartographic Society, CaGIS, and Elsevier; and modified with permission from Pingel and Clarke. Tanaka (1932) also devised inclined contours, traces made by intersecting evenly spaced parallel planes oriented between horizontal and vertical with the topography. Robinson and Thrower (1957) enhanced the technique, and the method was automated by Peucker et al. (1974), Yoeli (1976), and Kennelly (2002). Kennelly (2015) reviews its design considerations, as the inclined traces are not optimal for 3D effect. Hachures are short lines drawn in the slope direction (Lehmann 1799). Hachure maps using narrower and thicker lines on illuminated and non-illuminated terrain respectively give a 3D effect. Imhof (1982) cites the Swiss Dufour map series as achieving its apex of artistry. Yoeli (1985), Kennelly and Kimerling (2000), and Samsonov (2014) developed automated methods, although this technique proves difficult to fully automate. Slope, aspect, and curvature maps have been successfully adapted to create a 3D effect. Pingel and Clarke (2014) begin with slope shading, but attenuate it to the perceptual bias by which users overestimate slope. Moellering and Kimerling (1990) use aspect and slope to provide a relief shading effect, with the luminance of aspect colors defining a modified cosine curve. Brewer and Marlow (1993) modified this technique by using hues that maximize lightness differences for aspect and decreasing the lightness of chroma with increasing slope. Kennelly and Kimerling (2004) varied the luminosity of aspect colors to complement variations in value of relief shading. Kennelly (2008) also combines curvature with relief shading in a manner consistent with sky illumination models. Cartographic displays of terrain representation often combine multiple techniques in an aesthetically pleasing manner. Imhof (1982) dedicates chapter 14 of his book to the “interplay of elements” such as hypsometric tints, relief shading, slope shading, contours, rock drawings and hachures. Considerations include the scale of the map display, its intended use, and the nature of the symbology (e.g., area versus line symbols). 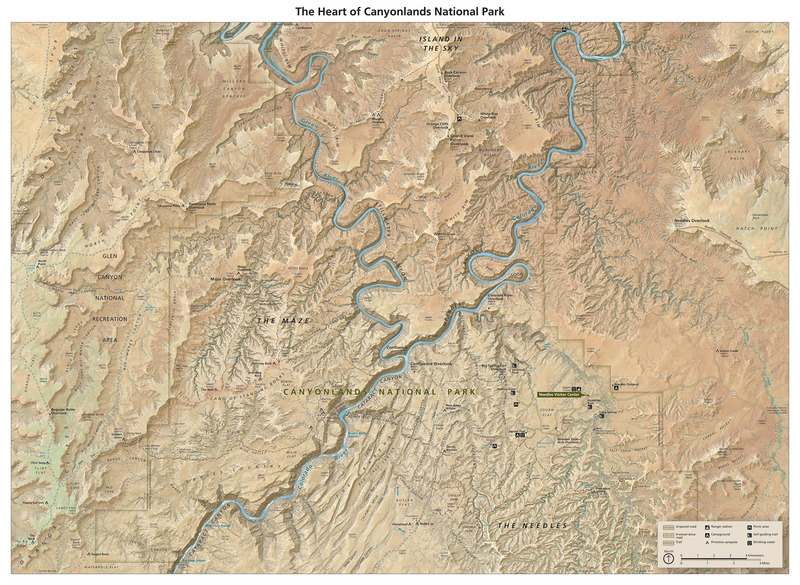 Patterson’s (2017) map “The Heart of Canyonlands National Park” is one exemplar in combining techniques (Figure 6). It achieves a stunning visual effect by combining of relief shading, texture shading using a fractional Laplacian operator (Brown 2010), and aerial photographs as a tinting layer. Figure 7. 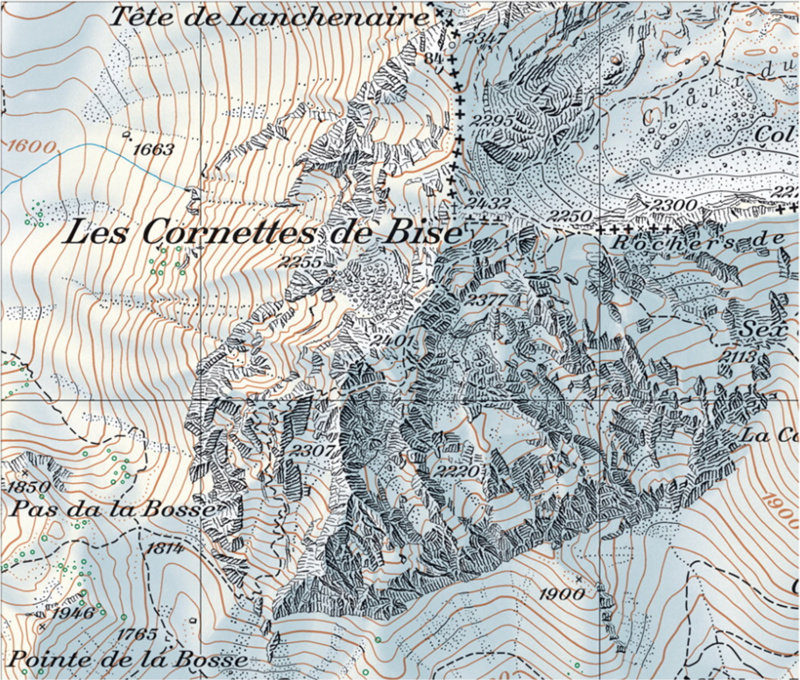 A map with computer-automated Swiss-style relief shading, rock drawings, and scree patterns (Jenny et al. 2014). Reprinted with permission from the British Cartographic Society. In terrain representation research, a great deal of effort has gone into automating the Swiss-style of terrain mapping. This includes relief shading and hypsometric tinting (Jenny & Hurni, 2006), and special localized enhancements such as rock drawings (Gilgen & Jenny, 2010; Jenny et al., 2014) of rugged outcrops (Figure 7), and scree patterns (Jenny et al., 2010) in areas of loose rocks. Brassel, K. (1974). A model for automated hill-shading. American Cartographer, 1, 15-27. Brassel, K., Little, J., & Peucker, T. K. (1974). Map supplement. Number seventeen: Automated relief representation. Annals of the Association of American Geographers, 64(4), 610-611. Brewer, C. A., & Marlow, K. A. (1993). Computer representation of aspect and slope simultaneously. Proceedings, Eleventh International Symposium on Computer-Assisted Cartography (Auto-Carto-11), Minneapolis, Minnesota. pp. 328-337. Brown, L. (2010, October). A new technique for depicting terrain relief. In NACIS Annual Meeting (pp. 13-17). Chang, K.-T. (2013). Introduction to geographic information systems (7th ed.). New York, NY: McGraw-Hill Science/Engineering/Math. Eyton, J. R. (1984). Raster contouring. Geo-Processing, 2, 221-42. Harrison, R. (1944). Look at the world: The Fortune atlas for world strategy. New York, NY: AA Knopf. Harvey, P. D. A. (1980). The history of topographical maps: Symbols, pictures and surveys. London: Thames and Hudson. Horn, B. K. P. (1982). Hill shading and the reflectance map. Geo-Processing, 2, 65-144. Imhof, E. (1982). Cartographic relief presentation. Berlin: Walter de Gruyter. Jenny, B., & Patterson, T. (2007). Introducing plan oblique relief. Cartographic Perspectives, 57, 21-40. Kennelly, P. J., & Stewart, A. J. (2015). Relief Shading with Sky Models. In Mountain Cartography: 16 Years ICA Commission on Mountain Cartography (1999-2015) (Karel Kris, Editor). Series on Geography and Cartography (Volume 21); Institute for Geography and Regional Research, University of Vienna, Cartography und Geoinformation, Vienna, Austria. Kimerling, A. J., Muehrcke, J. O. Buckley, A. R., & Muehrcke, P. C. (2010). Map Use: Reading and Analysis, 6th ed., Esri Press Academic, Redlands, CA. Lehmann, J. G. (1799). Darstellung einer neuen Theorie der Bergzeichnung der schiefen Flächen im Grundriss oder der Situationszeichnung der Berge. Leipzig. Lobeck, A. K. (1924). Block diagrams and other graphic methods used in geology and geography. New York, NY: John Wiley and Sons. Mark, R. (1992). Multidirectional oblique-weighted shaded relief image of the island of Hawaii. Technical Report OF92–422, U.S. Geological Survey Open File Report. Moellering, H., & Kimerling, A. J. (1990). A new digital slope—aspect display process. Cartography and Geographic Information Systems, 17, 151-9. Peucker, T. K. (1980). The use of computer graphics for displaying data in three dimensions. Cartographica, 17, 59-72. Peucker, T. K., Tichenor, M., & Rase, W. D. (1974). The computer version of three relief representations. In J. C. Davis and M. McCullagh (Eds. ), Display and analysis of spatial data (pp. 187-197). New York, NY: John Wiley and Sons. Pike, R. J., & Thelin, G. P. (1989). Shaded relief map of US topography from digital elevations. Eos, Transactions American Geophysical Union, 70(38), 843-853. Raisz, E. J. (1931). The physiographic method of representing scenery on maps. Geographical Review, 21(2), 297-304. Robinson, A. H., & Thrower, N. J. W. (1957). A new method for terrain representation, Geographical Review, 47, p. 507-520. Robinson, A. H., Morrison, J. L., Muehrcke, P. C., Kimerling, A. J., & Guptill, S. C. (1995). Elements of cartography (6th ed.). New York, NY: Wiley. Slocum, T. A., McMaster, R. B., Kessler, F. C., & Howard, H. H. (2009). Thematic cartography and geographic visualization (3rd ed). Upper Saddle River, NJ: Pearson Prentice Hall. Tanaka, K. (1932). The orthographic relief method of representing hill features on a topographic map. Geographical Journal, 79, 213-219. Tanaka, K. (1950). The relief contour method of representing topography on maps. Geographical Review, 40, 444-456. Visvalingam, M., & Dowson, K. (1998). Algorithms for sketching surfaces, Computers and Graphics, 22, pp. 269–280. Weibel, R., & Heller, M. (1991). Digital terrain modeling. In Maguire, D. J., Goodchild, M. F., and Rhind, D. W. (Eds. ), Geographic Information Systems: Principles and Applications. London: Longman, 269-297. White, D. (1985). Relief modulated thematic mapping by computer. The American Cartographer 12(1), 62-68. Wiechel, H. (1878). Theorie und Darstellung der Beleuchtung von nicht gesetzmässig gebildeten Flächen mit Rücksicht auf die Bergzeichnung. Civilingenieur, 24, 335-364. Yoeli, P. (1959). Relief shading. Surveying and Mapping, 19(2), 229-232. Yoeli, P. (1965). Analytical hill shading. Surveying and Mapping, 25(4), 573-579. Yoeli, P. (1966). Analytical hill shading and density. Surveying and Mapping, 26(2), 253-259. Yoeli, P. (1967). The mechanisation of analytical hill shading. Cartographic Journal, 4, 82-88. Yoeli, P. (1976). Computer-aided relief presentation by traces of inclined planes. The American Cartographer, 3(1), 75-85. Yoeli, P. (1985). Topographic relief depiction by hachures with computer and plotter. Cartographic Journal, 22, 111-124. Yokoyama, R., Shirasawa, M., & Pike, R. (2002). Visualizing topography by openness: A new application of image processing to digital elevation models. Photogrammetric Engineering and Remote Sensing, 68(3), 257-265. Derive values of slope and aspect from a contour map or from point elevation values. Apply various hypsometric tinting schemes to an elevation layer in GIS, and combine this with a relief shading layer using transparency or a similar approach. Discuss how relief shading changes the hypsometric color scheme. Compare the elevation values of a number of nearby and widely separated points on a DEM, and see how shaded relief values correspond to these differences. Critique examples of terrain representation based on their relative pros and cons. Design a stylized terrain map from a digital elevation model (DEM). You are provided a contour map in plan view of a mountainous terrain. Describe how you would select profile lines on the map that would give the map user an overall impression of the relief of the terrain? What special considerations are needed in creating a geologic cross section or block diagram when compared with making a profile or oblique terrain view, respectively? You are provided a contour map in plan view of mountainous terrain. Describe how you could create a hachure map overlay with 3D effect in both a manual and automated manner. Also describe how you can create an overlay of illuminated contours in both manners. Calculate and graph the dot product of surface normal and illumination vectors using angles between 0 and 90 degrees, based on brightness values varying from 0 to 255. 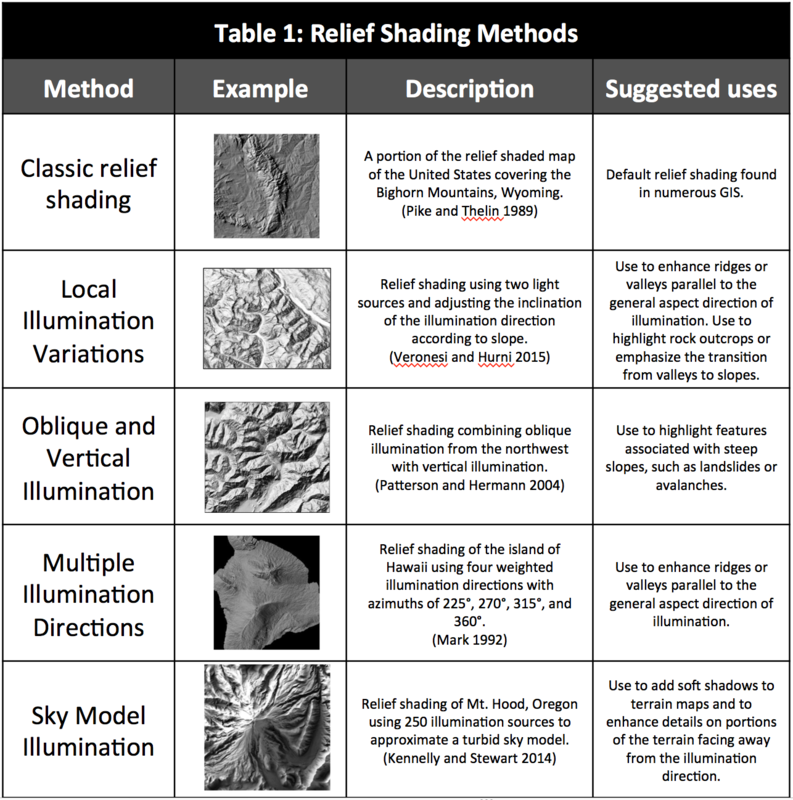 Explain why this is a reasonable range of values for relief shading in most terrains. Design a color legend for hypsometric tinting, keeping in mind how colors may be perceived to vary with elevation, and how the colors will vary when combined with relief shading. Terrain Cartography: Software for Terrain Mapping. (2017). Retrieved from http://terraincartography.com.